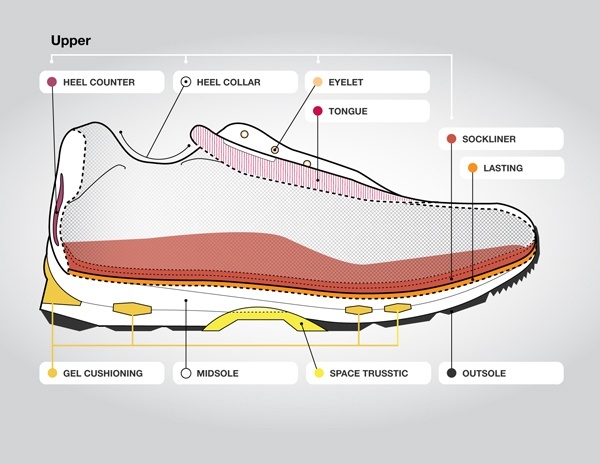 See all the parts of a running shoe in this comprehensive ASICS shoe anatomy. ASICS running shoes contain a lot of technologies and advanced materials, all designed to work with your feet to give you a great running experience. Some of these components are not visible from the outside, while others may just sound complicated, like Space Trusstic. So here is a comprehensive ASICS running shoe anatomy, to show you what exactly makes a great running shoe. While made up of many different components, ASICS running shoes are designed from one overarching principle, known as the Impact Guidance System. I.G.S. is the ASICS design philosophy which aims to make all shoe components work together effectively to allow the body to perform in a natural manner. Its goal is to compliment, not correct, how the legs and feet move. The holistic approach of I.G.S. also ensures that new features are only added when they work with the existing components to contribute to this goal. The outsole makes up the base of the running shoe. ASICS scientists have developed AHAR+ as the perfect outer sole material. AHAR stands for ASICS High Abrasion Resistance Rubber. It has great cushioning and grip qualities on a range of surfaces, wet or dry. But it is also very durable, so runners can run longer in the same shoes. The Space Trusstic is a plastic bridge with a space behind it found under the arch section of the shoe. The Trusstic gives the shoe strength and stability, without sacrificing flexibility. The space behind the bridge allows the arch of your foot to deform while you run, complimenting the natural motion of the foot. ASICS has also created the Gender Specific Space Trusstic, as part of its aim to reinvent running shoes for wome. The midsole is a layer of spongy material between the outsole and the upper. ASICS running shoes use Solyte and SpEVA as midsole materials. Invented at the ASICS Institute of Sport Science, these cushioning materials combine bounce and durability, and yet are lightweight enough for longer runs. Cushioning materials are often added to the heel and forefoot of running shoes to help attenuate the landing shock and loading forces experienced by the body while running. ASICS uses a unique GEL in the heel and forefoot to reduce shock. Thanks to GEL cushioning your body has to put less energy into stabilising tasks and can focus more on forward motion. This makes running less tiring and thus reduces chances of injury. The last is a layer of material which is stitched to the upper. The sockliner is placed on top of the last. ASICS shoes use Solyte and SpEVA as a lasting material. This material, invented at the ASICS Institute of Sport Science, has a perfect blend of cushioning and durability. It is used in various densities (45, 55 and 65) to create softer or harder lasts for different running shoes. For instance, women's running shoes often use a softer last. The sockliner (also called insole) is the first layer of soft foam which your foot rests on inside the running shoe. ASICS has developed sockliners made of foam which offer cushioning and make sure your foot fits comfortably inside the shoe. Most ASICS sockliners are removable, making them easy to clean or customise. The tongue is a separate strip on the upper. It makes it easier to put your shoes on and take them off. It also prevents the laces from rubbing against the instep of your foot. The eyelets are the holes the shoelaces pass through. The eyelets of a running shoe should be large enough and smooth enough so you can easily and quickly adjust your laces. The heel collar (sometimes called heel cuff) forms the top of the shoe, supporting the heel and Achilles tendon. The collar prevents the foot from slipping inside the shoe and makes it more stable to run in. ASICS running shoes feature a Personal Heel Fit (PHF) made out of memory foam. Soft enough for the heel to be comfortable in the shoe, this spongy material also provides a snug fit as it shapes itself around the contours of your heel every time you put the shoe on. The heel counter is the internal plastic structure of the shoe which wraps around the heel of your foot. It holds the heel in position during the movements of running. As the heel counter is often one of the heaviest parts of the shoe, ASICS scientists at the Institute of Sport Science have strived to produce heel counters which offer enough support and stability while reducing their weight as much as possible. The upper is the top part of the shoe, designed to firmly hold your foot in place inside the shoe. ASICS shoes use soft, form-fitting and breathable materials in the upper. These types of materials keep your feet cool and in position. They also help to keep your feet dry in wet weather. South AfricaCHANGE REGION The stripe design featured on the sides of the ASICS® shoes is a registered trademark of ASICS Corporation.